Beautiful couple, so inviting!I enjoy this last series Don, "East Fork" brings back good memories to me. 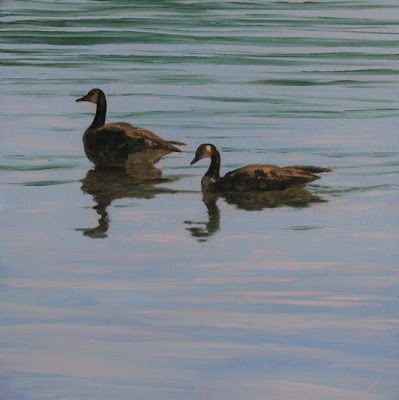 a wonderful piece: you've captured a moment that i often see when walking near water... i love how ducks even after a comotion just ruffle their feathers and shake off all the bad and carry on happily together. r.
I REALLY like this one! Lovely and peaceful. Hi Pierre--thanks so much, that means a lot! Hi Rahina--thanks! I don't know if the saying is common in Scotland, but here we say "like water off a duck's back" if we want to express someone shedding their troubles or problems. Fantastic job on the water here! Very soft and subtle waves yet detailed and intricate at the same time. Thanks, Dean. These little alla prima paintings can be both challenge and joy. I love the ability to blend into the wet paint, but sometimes am frustrated at the difficulty of laying strong darks over lighter colors. Well done! My husband was looking over my shoulder as I pulled up your blog, and we both loved this one.